Maj-Britt (pronounced Mybritt) Mobrand is an expert weaver and teacher of weaving, and a founder member of the South Berkeley Artists. I used to drive past her very enticing Glimakra Weaving Studio, and wonder who worked there, and how they were making a living as a craft weaver in the 21st century. I was very fortunate to meet Maj-Britt, as part of the East Bay Open Studios 2012, and she shared some of her work and process with me. 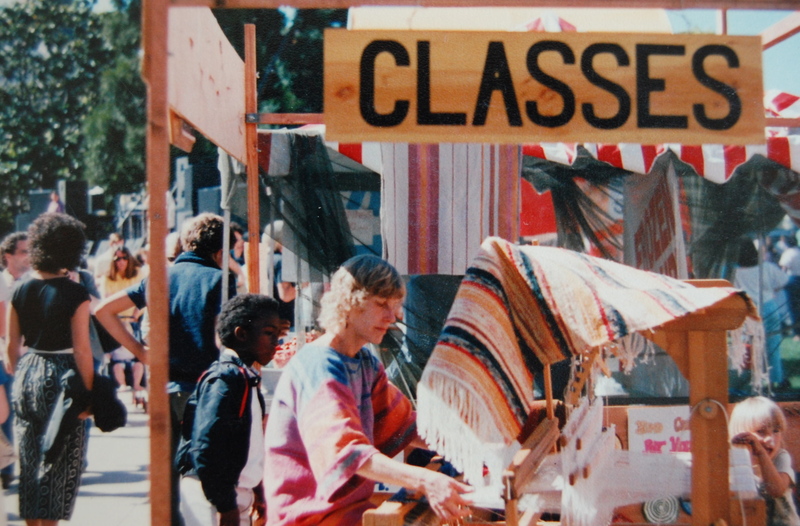 She came to the US in 1961 and learned to weave in classes at the Berkeley Adult School and in Sweden. It’s perhaps no surprise that she comes from a family of weavers and textile people from the south of Sweden. 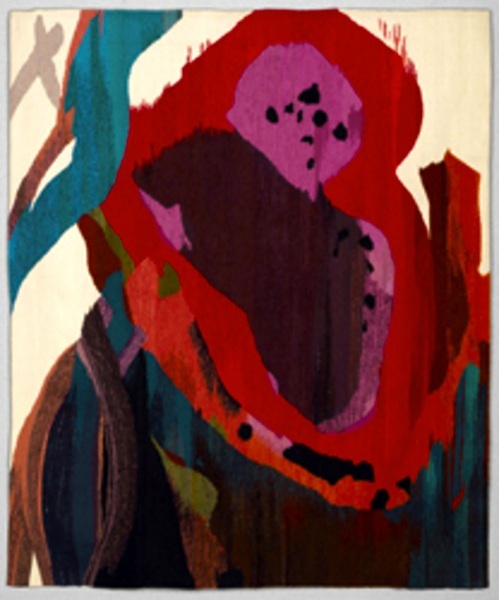 Many of her pieces are inspired by her love of jazz, and often use strong colors and abstract forms that seem to reflect her dual heritage as well as her love of practicality and order. Maj-Britt explained that the weaving loom was a precursor of the computer and I began to understand and marvel even more at the parallels and relationships between mathematics, music and weaving. She often uses complex repetitive, graduated rhythms, varied textures and subtle color progressions, though some pieces are more subdued and earthy. I noticed as she worked in her studio, that even the sound of the loom in operation has its own soothing musicality. “You start a weaving and see where it will take you” she told me. Being a craftsperson and artist can often be a solitary and all-absorbing activity but Maj-Britt also teaches and is not shy about bringing her art to the streets. The vintage image above dates from the 1970s when the Berkeley Coop was in full swing, and note that she still wears that groovy hand-woven dress. One large abstract piece welcomes visitors to the studio. “Watermelon Man”, a well-known Herbie Hancock track, began life as a small watercolor by one of her grand-daughters and she found it so unusual and wonderful she wanted to use it as the basis for a larger work. 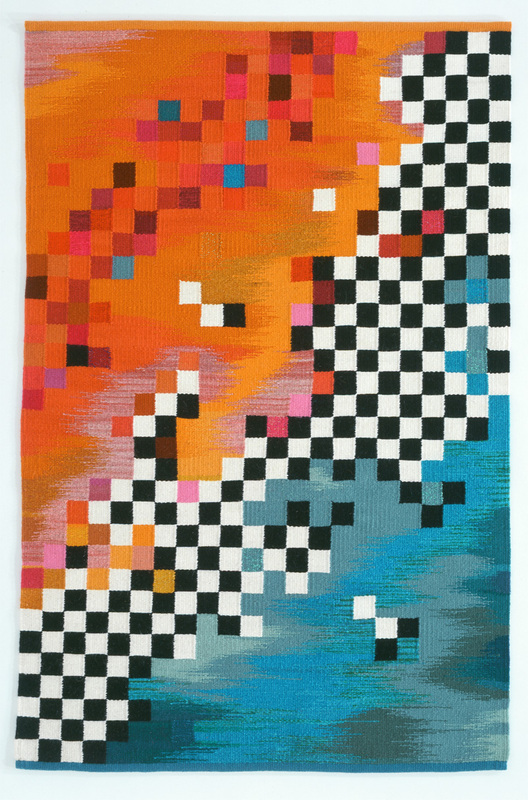 The original design was quite small and Maj-Britt had to enlarge it to make a huge and distinctive weaving at 48″ x 58′. In addition to the freeform weaving shown here, she also takes commissions and produces beautiful hand-woven scarves and wraps in a myriad of colors and combinations. A short blog post can only be a taster of her work, and photographs do not easily reveal the variety of colors and textures or the beautiful natural yarns that Maj-Britt uses and so I urge you to visit her studio during one of the weekends of East Bay Open Studios, June 1,2 and 8,9 2013. This entry was posted in Art Journal, South Berkeley Artists and tagged Art journal, Berkeley, CA., California, Classes, East Bay, Maj-Britt Mobrand, open studio, San Francisco, Weaver, Weaving. Bookmark the permalink.